Have any of you looked at the micro fauna that are in our tanks? I have a 10g dirted and planted sparsely sitting there empty for the past few weeks. I decided to look inside and was surprised to see small aquatic insects or pods crawling everywhere. Closer look, hydras everywhere, some of the largest ones I've seen. Another look, some blackworms are crawling in the dirt and gravel. 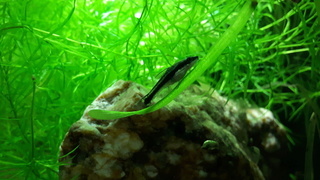 Its surprising to see all this life in our freshwater tanks. I may need to try an experiment of bringing in lake mud and plants and letting it sit to see what emerges from all of the muck. @caoder wrote: Have any of you looked at the micro fauna that are in our tanks? I have a 10g dirted and planted sparsely sitting there empty for the past few weeks. I decided to look inside and was surprised to see small aquatic insects or pods crawling everywhere. Very interesting. I have had tubiflex worm in my tank and a big platy ate it after literally sniffing it out and battling it for 20 minutes. Seen hydra before too. You never know what can end up in our tanks but a lot is brought in on plants. The only thing I have noticed in my tank (other than snails) has been scuds, which I actually intercepted on some new plants from an unfamiliar LFS before they ended up in the tank. 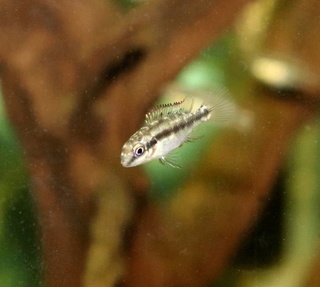 They aren't quite microfauna, but they did get introduced to the tank in a similar manner. If I had a closer look or could magnify things, I'm sure I would see much more. There is obviously enough floating around in there to keep my larger filter feeding shrimp happy and healthy. Only once I have had certain worms crawling at the division between water and air. It was also an empty tank (no fish, that is). I fed them to the fish and they were very happy with the snack! I wish I knew more about freshwater microfauna ID! 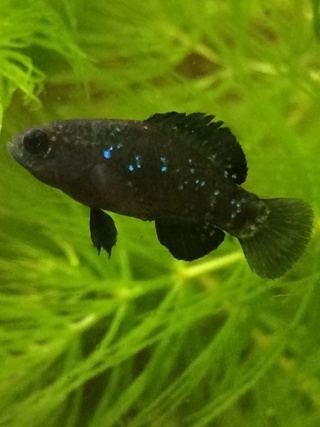 When I was cycling the 20 gallon there were tons of itty bitty little swimmy things in there. In particular, there were a bunch of little things that kind of looked like rocket ships. I remember seeing the same types of things in the water when we used to go pond dipping for aquatic insects as kids. As soon as I added fish to the tank, most of the visible microfauna disappeared. I imagine they did make a tasty snack. I think the lake muck idea sounds like a great experiment. I'd avoid putting anything from the lake directly into your inhabited tanks though. I've read that it could introduce wild pathogens into the aquarium. I'm not sure if that applies to material from small fishless ponds though...? Anyone have any thoughts/input about this? 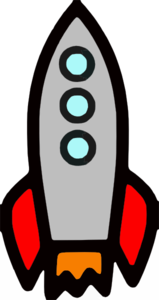 Rocket ships : sounds likre paramecium. To the naked eye, they look like very small "slippers" that float through the water. They are some of the "larger" type of micro organisms that can be seen in aquarium water. As well they are an important component in infusoria, ie food for tiny fry. Paramecia - maybe...? They seem pretty distinctively 3-lobed, though. Like having a main "body" and then two lateral lobes. I just looked up a bunch of photos/drawings of paramecia and none of them seem to take this distinctive shape. What are your thoughts alex? All these micro organisms are one of the reasons our fish can go for so long without food while we are away... they find their own. I see what looks like very tiny scuds taking over the tank, maybe a few more weeks and they will be large. Scuds looks almost exactly like the amphipods in salt tanks. Copepod agreed. They swim in jerky motion. 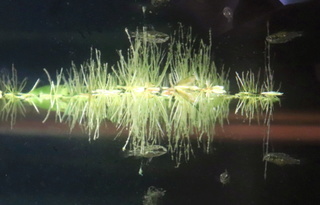 The large centre body is the copepod itself. The females will have the two egg sacs. They are fairly large and not microscopic. They are excellent fish food. If you can catch them you can culture them fairly easily. Copepods, yeah! I think what I was noticing was the females with the egg sacs. The photos look about right. Too bad I didn't capture any to culture them before they all got eaten up!